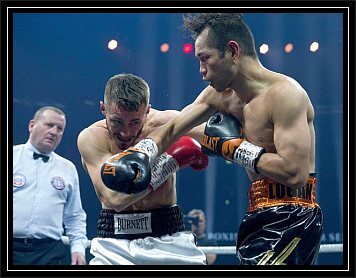 An English betting establishment called Betfred has refused to pay out a 12-to-1 wager because newly-crowned WBA bantamweight champion Nonito Donaire’s family put money down on a knockout win over Ryan Burnett in Glasgow last weekend. Donaire’s wife Rachel and father-in-law Gerry Marcial are up in arms especially since she was paid out by another betting station. The bets weren’t astronomical. In total, they bet the equivalent of about $1,840 in a pool with conditioning coach Mike Bazzel and security staffer Brian Singer. Donaire himself didn’t place a bet because that’s not allowed. Of the amount that was wagered, $730 remains unpaid. The odds installed Donaire a 6-1 underdog to win and a bigger 12-1 underdog to score a knockout. One betting station accepted a $590 wager for a knockout win but split the payout on odds of 12-to-1 and 10-to-1. Betfred declined to accept bets of more than $330 each. Marcial left Glasgow earlier than Donaire’s team because of work in Las Vegas and asked his daughter to pick up his winnings. Betfred wouldn’t pay out. For a betting company that has over 1,650 outlets and stations in 51 race courses all over the UK, it’s ridiculous to hold out on legitimate bettors. Betfred has been around since 1967 and surely, wouldn’t risk tainting its reputation by declining a payout.